Three men in a boat at the top of Geirann Mill loch with the only breeze of the day and not a fish in sight. I’ve done this drive west a good 50 times; the switchback road to the Isles in early autumn, past birks stippled with yellow and the bracken a cinnamon glow. 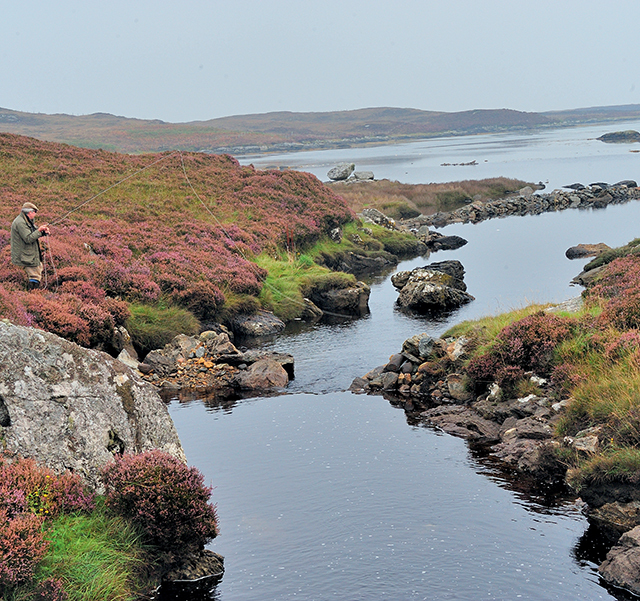 I’m off to North Uist in search of silver—those lovely late-run sea trout of the Outer Hebrides only, this September, there’s a difference: The Editor and I are being filmed by a team from Spun Gold TV, who are making a documentary series about Country Life. We absolutely must catch a fish for the cameras. I agonise to Mrs Reel Life (a former television producer). ‘Just try to be yourself,’ she sighs. Despite an awkward moment when my car refuses to start I have aboard Jane the producer, Jon the director of photography and sound recordist Marc, and the camera is running we make it to the pier on Skye for our evening crossing. You can fly into the islands, but the spectacular way to savour your approach is by sea. Often, The Minch is as grey and seething as a porridge pot in need of a spurtle, but this evening, as Mark and I pose at the rail of the CalMac ferry for our Titanic moment, a perfect sunset bleeds along the smooth gunmetal of the water. I propose a little monologue about marine wildlife, but Jane politely declines. We repair below for a slug of malt. ‘Have a good life,’ says Lina the barlady. Well, we’re certainly trying. With its hundreds of lochs, North Uist is more water than terra firma a place of derelict beauty that combines peat hags, drumlins and mammillations of ancient rock (the Archaean gneiss is some 3,000 million years old); there are also areas of more fertile grazing, formed by blown shells and known as the machair. It’s popular with birders corncrake and the migratory phalarope are great draws and those who prefer shooting, although the days are gone when that Victorian C. V. Peel (a contributor to The Field) could make a morning’s bag comprising a great northern diver, a curlew and a grey seal. When my father-in-law, The Doctor, first came here for the fishing, we were told to look out for Fergus, who was to be our gillie. It transpired the insolent-looking, tangle-haired youth power-smoking in the corner of the bar was the Laird himself and we have often fished together since. He’s masterminding our present visit and we’re guests at Langass Lodge (the delightful sporting establishment run by his brother Niall and his wife, Amanda). Fergus admits that, weather-wise, the prospects aren’t great, but reports there are plenty of sea trout in the estuarial sea pools waiting for rain so they can run up to the lochs. That’s what we’re after: streamlined and capricious, the sea trout is an enigmatic quarry. Set one beside some Southern ‘stockie’, and you’re comparing Pegasus with a pit pony. The Prof tries a likely run into the Geirann Mill sea pool. The first morning, we prepare to launch on Lower Skealter and the sky is a hard, ceramic blue, the surface of the loch as smooth as a ballroom floor. ‘Filmically, ideal conditions,’ rasps the Laird sardonically. Loch fishing requires a nice, breezy ‘jabble’. It looks hopeless, but, as a Gaelic sage once reminded me, ‘with fishing, all things are possible’. I blither to camera about the evolution of the Muddler Minnow pattern, but I suspect Marc has switched off my mike. When Donald our gillie delivers a word-perfect speech about Hebridean culture, howeve while simultaneously readying two boats that’s definitely recorded. A sea eagle drifts overhead. 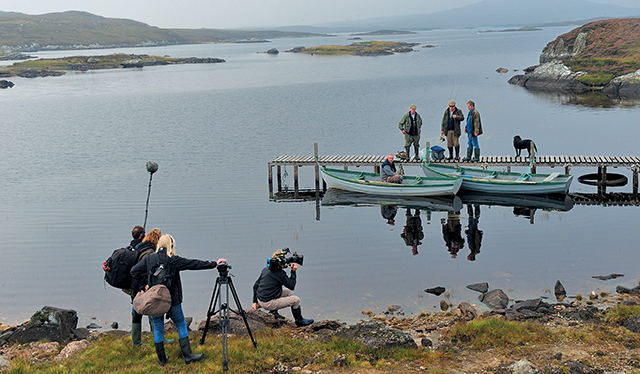 The landscape is acting its socks off and the crew gets plenty of takes, even if we anglers do not. Next stop is Ardheisker sea pool, where once I enjoyed a bonanza. You’re allowed to use spinning tackle in these tidal reaches, but every time I hooked a fish on my Toby spoon, The Doctor (a diehard, fly-only purist) announced: ‘That doesn’t count, laddie.’ Today, there are several sea trout swirling around, but they won’t commit themselves. In desperation, I cast at one that rises in front of Editor Hedges. ‘That just might cost you your job,’ he growls. I’m starting to wonder if the presence of cameras is acting as a jinx. The crew is starting to wonder how two grown men can have dragged them to the far margins of Britain, located a pool full of fish and failed to hook a single one. We repair to Langass for the consolation of John Barleycorn and a slap-up dinner (John Buchanan is one of Scotland’s proper chefs and the food is sensational). We’re having a great stay, but, next day, it’s even hotter. On glorious Geirann Mill, there isn’t a crinkle of wind. We try dibbling and trolling, Zulus, Shrimps and Bumbles not even a finnock. The Boss and I keep flailing away like a couple of Viking berserkers. Two obliging brownies are kept for our shore lunch. I prepare a barbecue: cooked off the hook, these fish are finger food fit for the gods. But I’m doubtful I’m going to get my own series. Of course, as soon as the camera crew departs, the fish can’t keep away. 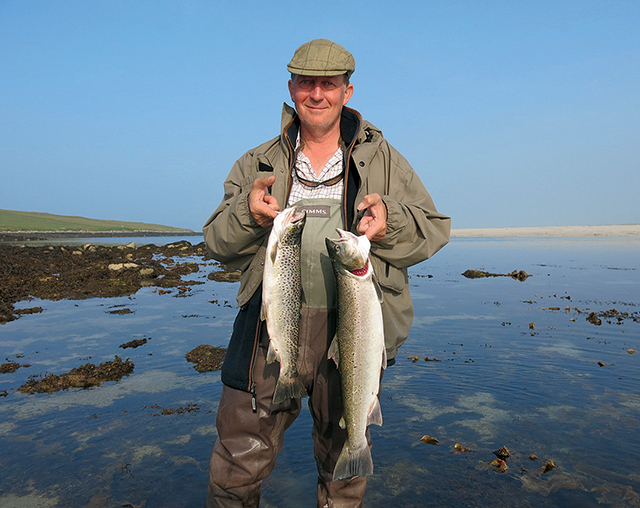 The Boss, Editor Hedges, with ‘the sea trout of a lifetime’. Naturally, once the crew departs, we enjoy a day of days. The Laird takes us to a little-known sea pool and The Boss wades in, lustily flinging forth his Flying Condom. The first fish weighs just shy of 3lb and I applaud. His second has me calling: ‘Doesn’t count, laddie.’ The third prompts some bloody thoughts concerning the former Fleance. When his fourth pulls the spring balance down at 5½lb the sea trout of a lifetime I am silenced entirely. With fishing, all things are possible.